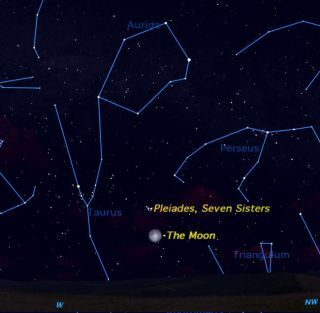 On Sunday (Nov. 21), the Pleiades star cluster will appear above the full moon at both sunrise and sunset. This sky map shows where to look before sunrise to see the event. This story was updated at 6:09 p.m. ET. An odd thing is going to happen onSunday (Nov. 21): Justbefore sunrise, the full moon will appear on the western horizon justbeneaththe Pleiades, the brightest star cluster in the entire night sky. The Pleiades is a cluster of brightstars located in theconstellation Taurus about 410 light-years from the sun. Asthe brightest starcluster, the Pleiades is a showpiece in both binoculars and smalltelescopes. This sky mapshows how to spot the Pleiades alongwith the full moon on Sunday morning. The morning sky show is just forstarters. The full moonand thePleiades will give an encore 12 hours later just aftersunset, when themoon will appear on the eastern horizon. This is normal, and happens everymonth. But this time,the Pleiades is again immediately above the moon. All three are present in bothimages, but theirorientation is completely different. Look closely at the Pleiadesthemselves,and you?ll see that they have flipped in 12 hours. So, what's going on? There are two events that occurduring the day of Nov. 21that affect this month's full moon appearance. First, full moon occurs at 12:27p.m. EST (1727 GMT).Technically, full moon is an instantaneous event:It happens at theprecise instant the sun, Earth and moon fall in a straight line. At the time full moon occurs, theEarth is rotated so thatthe moon is below the horizon for observers in North America. So,neither ofthe moons in the two sky map images here is a truly full moon: thefirst is awaxing gibbous moon, about six hours short of full, and the second is awaninggibbous moon, six hours past full. To the human eye, both look "full"so we tend tosay that both are full, even though this isn?t 100 percent accurate. The other event that occurs is thatthe moon and thePleiades are in conjunction at 1 p.m. EST (1800 GMT). At this time, themoonand the Pleiades are as close as they can get this month, the moonbeing 1.3degrees south of the Pleiades. This conjunction is not observablefrom the United States becausethe moon is below the horizon for North Americans. Coming back to the sky maps, webegin to see what?s goingon. The moon has in fact moved from one side of the Pleiades to theother side,passing the Pleiades around just past noon while both moon and Pleiadesareunder our feet. The radical change in theorientation of theconstellations is also a normal effect. If you watch any constellationover anentire night, you will see that it rises in the east in oneorientation, movesin a wide arc across the sky, and then sets about 12 hours later in acompletely different orientation. Having the moon and the Pleiades asthe centerpiece inthis arrayof constellations gives us a point of reference, and itbecomes much easierto see how the constellations change their orientation from rising (asseen inthe sunrise sky map) to setting (as seen in the sunset sky map). This article was providedto SPACE.com by StarryNight Education,the leader in space science curriculum solutions.